The RP Photonics Buyer's Guide contains 10 suppliers for mode locking devices. Using some kind of mode locking device (or mode locker), a laser can be forced into the operation regime of mode locking, where it emits a regular train of ultrashort pulses. For active mode locking, one requires some kind of intensity modulator or phase modulator which is inserted into the laser resonator. For passive mode locking, one uses a saturable absorber. In most cases, an intensity modulator is used, which is operated with a sinusoidal drive signal, the frequency of which matches the round-trip frequency of the laser resonator and the pulse repetition rate of the output. 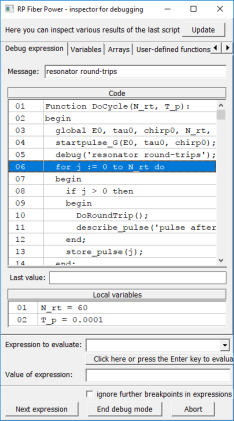 (In case of harmonic mode locking, the drive frequency is an integer multiple of the round-trip frequency.) Typically, one uses an electro-optic modulator, but for mode-locked semiconductor lasers electroabsorption modulators can also be a good choice. Another possibility is the use of an acousto-optic modulator with a frequency-modulated drive. In a linear resonator, the modulator should be placed close to an end mirror. The circulating pulse passes the modulator at those times where it experiences minimum loss. Due to the sinusoidal loss modulation, the temporal wings of the pulses experience slightly higher losses. This leads to a slight temporal compression effect, which in the steady state of the laser can compensate for temporal broadening effects, for example from the limited gain bandwidth of the gain medium. In case that there is a slight timing error of the circulating pulse, the modulator creates a “restoring force”, which tends to “pull it back”. The modulator suppresses any other light circulating in the resonator, because while the net round-trip gain for the circulating pulse is zero in the steady state (by gain saturation), the higher losses at other times lead to a negative net round-trip gain for other light. A higher modulation depth helps to obtain a shorter pulse duration, but this influence is quite weak, as explained by Kuizenga–Siegman theory. The tolerance for a resonator length mismatch is also somewhat increased with a higher modulation depth. It is also possible to use a phase modulator, although it is somewhat more difficult to understand how that can induce mode locking. The modulator should not cause any parasitic reflections remaining in the beam path. Surfaces which are exactly perpendicular to the beam path should therefore be avoided. The insertion loss should of course be as small as possible in order to maintain a good power conversion efficiency of the laser. One may fine-tune the resonator length with piezo actuator, which is for example placed in the mount of a laser mirror. The laser may then work with an externally given drive frequency, which however can usually be varied only within a small range. Instead, one may tune the drive frequency. Tuning of the repetition rate is then possible by modifying the resonator length. In any case, one needs to generate an error signal, telling the feedback electronics in which way to modify the resonator length of the drive frequency. That can be done based on a signal from a fast photodiode exposed to some beam split from the output beam, or alternatively using some parasitic transmission of a highly reflecting resonator mirror. The method is called regenerative feedback. It needs to initiate the mode locking. Usually, immediately after turn-on the laser will be in continuous-wave operation with some more or less substantial intensity noise. The saturable absorber will always favor the most intense part of the circulating radiation and eventually let only a single pulse “survive”, typically only after thousands of resonator round trips. In the simpler case of a “fast” absorber, having a recovery time well below the pulse duration, both the leading and trailing temporal wing of the pulse are attenuated, leading to a pulse shortening effect similar to that of an active modulator. However, the loss modulation is much faster, since it is driven by the pulse itself. Therefore, passive mode locking typically leads to much shorter pulse durations. Mode locking can also work well with “slow” absorbers, where the recovery time may be more than 10 times longer than the pulse duration. One may expect stability problems due to positive net gain “behind” the circulating pulse, but in fact stability is given if the recovery time is not too long . An absorber also suppresses light circulating at other times, which (as long as it is weak enough) cannot saturate the absorption and therefore experiences higher power losses. In most cases, one uses a so-called semiconductor saturable absorber mirror (SESAM)  for passive mode locking. Such devices can be tailored for a wide range of operation parameters, and are therefore successfully used for a wide range of mode-locked lasers concerning pulse durations, pulse repetition rates, optical wavelength, output power etc. SESAMs can be used both in solid-state bulk lasers just as end mirrors, and in mode-locked fiber lasers. In the latter case, it is preferable to use a fiber-coupled SESAM, which may either contain a fiber which is simply butted to the semiconductor structure, or a fiber collimator for operation with larger mode area. Operation wavelength: both the contained Bragg mirror and the absorber layer(s) must be suitable for the intended operation wavelengths, so that these devices usually work only within a wavelength range with a width of a few tens of nanometers. For operation in new wavelength regions, a substantial new device development may be necessary, involving new materials, adapted design parameters etc. Modulation depth: This is the maximum change of reflectivity due to the absorber saturation. It should be large enough to safely initiate the mode locking and produce short pulses, but not too large, since otherwise one may obtain a reduced power efficiency, absorber damage or Q-switching instabilities. Recovery time: This is the time for the saturated absorption to recover to its normal state. Often, it is substantially longer than the pulse duration, but if it is too long, instabilities will result. The obtained pulse duration will often have little dependence on the absorber recovery time. Saturation fluence: this together with the beam area determines the saturation energy, which should usually be of the order of a quarter of the circulating pulse energy, or sometimes less. Some other types of saturable absorbers are also sometimes used for mode locking, e.g. absorbers based on carbon nanotubes [8, 9, 11] or graphene. There are also various kinds of artificial saturable absorbers. These are devices which exhibit decreasing optical losses for higher intensities, but not based on real light absorption. Such devices can be based on e.g. The optimum parameters of a saturable absorber strongly depend on the type of laser and the intended operation regime. The choice of absorber parameters should be based on a comprehensive quantitative understanding of the system, because otherwise non-ideal performance parameters or even instabilities can result, in other cases premature absorber degradation or instant destruction. Ideally, one should study the intended operation based on a numerical pulse propagation model.